Discover the dark secrets of Guillermo del Toro’s masterpiece, Pan's Labyrinth, in this thrilling exploration of the film’s creation. Released in 2006, Guillermo del Toro’s Pan’s Labyrinth was hailed as a dark, thrilling masterpiece and announced the filmmaker as a major creative force, garnering him a loyal fan base attracted to his technical skill and wild imagination. 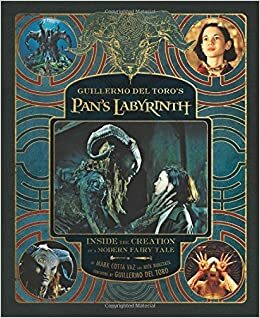 To celebrate the tenth anniversary of this acclaimed fantasy, Guillermo del Toro’s Pan’s Labyrinth provides the definitive account of the film’s creation. Written in close collaboration with the director, this volume covers everything from del Toro’s initial musings, through to the film’s haunting creature designs, the hugely challenging shoot, and the overwhelming critical and fan reaction upon the its release. Including exquisite concept art and rare unit photography from the set, Guillermo del Toro’s Pan’s Labyrinth gives readers an exclusive, behind-the-scenes look at how this modern classic was crafted for the screen. The book also draws on interviews with every key player in the film’s creation, including stars Ivana Baquero, Sergi López, Maribel Verdu, and Doug Jones; producers Alfonso Cuarón and Bertha Navarro; and director of photography Guillermo Navarro, to present the ultimate behind-the-scenes look at this unforgettable cinematic classic.